“If you don’t have an occasional failure, you are not taking enough fashion risk” – Suzanne at Says Who. You may remember that I am very attached to Beth Ditto’s clothing line from 2009 and 2010. 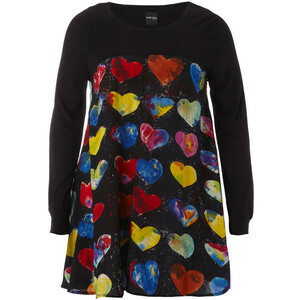 I bought this dress from the Beth Ditto Collection on Ebay from someone in the U.K. for $136. This U.K. Ebay seller did not usually mail to the U.S. but I asked nicely because I was desperately in love with the heart infused signature dress and I was very grateful when the U.K. seller went to the trouble of changing their Ebay listing so that they were then allowed to go to the trouble of mailing it to me in the U.S. MANY U.K. sellers are not willing to do that, I am sure it is a lot of extra trouble. I bought the dress because it was a size 22UK – size 20US and I had just purchased a similar (or so I thought) dress, or tunic, as they might say, in purple in a size 24UK which is a size 22US, which turned out just a little large and I had to have it taken in. Thus it seemed like the UK size 22 should be fine and would be worth all the bother.